Health worker: Your sickling test is positive, which means you have Sickle Cell Disease. Patient: That explains why I am always ill. Patient: Are you sure, but I hardly fall sick. Health worker: Your sickling test is negative, which means you do not have Sickle Cell Disease. Patient: That is good news, so I have nothing to worry about. Can you tell what is wrong in each of the narratives above, especially from the health worker’s statements? My hope is that by the end of this article most of us, if not all can tell what is wrong with these narratives. A sickling test is more or less a first response test to determine whether a person has the HbS (haemoglobin S) genotype or not. The HbS genotype has a weak cell structure which gives it the tendency to fold up or cave in (sickle) when it loses oxygen. The sickling test mimics and amplifies this process outside the body. It involves a 2% solution of a special salt (sodium meta bisulphate) a slide, coverslip and microscope. A drop of blood from the patient is put on a slide and a drop or two of the solution is added and mixed well with the coverslip. The coverslip is placed over the mixture when done and excess solution and blood is wiped off the sides of the slide. The waiting period for this test is at least 15 minutes and a maximum of 45 minutes after which the cells are observed under a microscope. The solution deoxygenates (removes oxygen from) the Red Blood Cells causing the HbS carrying Red Blood Cells to sickle. The coverslip creates an air-tight medium (environment) preventing the Red Blood Cells from being re-oxygenated. A positive sickling report is obtained when the Red Blood Cells sickle under the conditions stated, while a negative report is for all samples where the Red Blood Cells do not sickle. This test can only be used to concretely detect or show the presence of HbS. The presence or otherwise of HbA may be inferred from the results obtained. It is important to note however that this inference may be wrong in cases such as Hb CC where the test results will be negative (narrative C). This test can also not tell which other Hb is present, thus it is improper to label someone as a Sickle Cell patients on the basis of a single sickling test. An Hb electrophoresis is required to determine the exact genotype and must always be performed to come to a diagnosis. A person that is AS will test positive for sickling because of the presence of the HbS but this person does not have sickle cell disease. Such persons are said to have the sickle cell trait, they often do not have symptoms of Sickle Cell Disease (narrative B). These persons may however experience symptoms in conditions of low oxygen saturation or high altitudes or may be unwell due to conditions unrelated to Sickle Cell Disease. It is best to perform an Hb electophoresis for confirmation and investigate them fully for other conditions(narrative A). The last limitation has to do with preparation and the actual process of performing the test. Using inadequate solution or waiting too long to examine the cells ie. allowing the cells to dry up before microscopy leads to deformed cells (crenated cells). 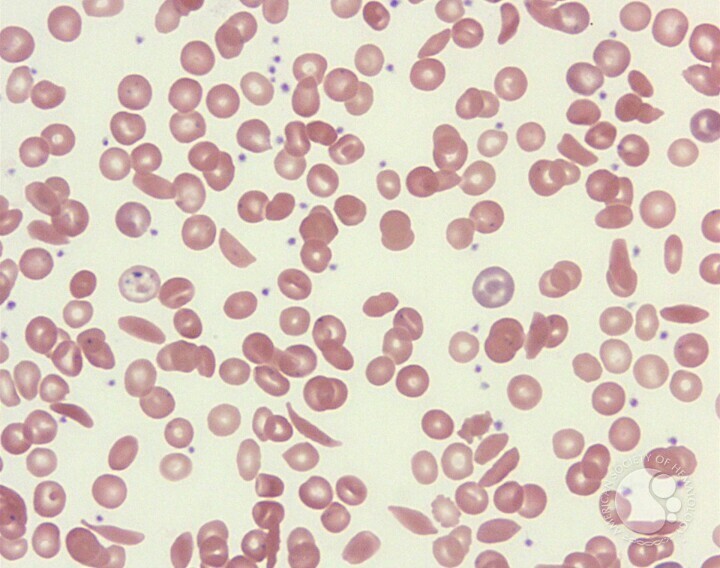 These may be interpreted as Sickle Cells and give a false positive result when viewed by an “untrained” eye. A sickling test and blood film comment seek to locate cells which are termed irreversibly sickled cells. Every sickle cell patient or person with the sickle trait has some of their cells permanently sickled (up to about 4% lower in the trait). These cells are unable to absorb oxygen even when oxygen is present and crises occur when a large number of cells become irreversibly sickled. Conditions that facilitate an increase in irreversibly sickled cells are: dehydration, poor oxygenation due to impaired breathing, acidosis (acidic blood) due to build-up of carbon dioxide, infection, extreme weather conditions etc. The use of sodium meta bisulphate replicates this process outside the body and allows Red Cells within the given field to be observed for this phenomenon. To be sure of your exact Sickle Cell genotype it is important to undergo an Hb electophoresis test. (Mr. Mensah is a Laboratory Technician at the Haematology Department SBAHS (Uni. Of Ghana). He has been working there since 2012 and is a volunteer with Sickle Life. Please contact Sickle Life for any questions on Sickle Cell testing and opportunities for testing for yourself or organization. ← My Sickle Life: Combating Sickle Cell through Awareness. The cost depends on the lab used. Costs range from about 30 to 50 cedis for both the sickling and hb electophoresis. A few labs may provide testing at a cheaper rate. If you are sickling negative,what are your likely genotype? AA, AC, CC… Any genotype that does not include S.
please can an AC marry and AC? Likely genotypes include AA, AC, CC and other such variants. All with the exception of S.
Pls I went in for sickling test and it turns out to be negative n fbc is also negative what does this means. Thanks. can one test positive for Sickling Test and his Hb Electrophoresis result AS. if yes, what’s the meaning of that? Please if am O+ blood group what genotype will i fall in? I tested and I was positive. I am blood group B+ what genotype will i fall under. Please if I hardly fall sick what will likely be my genotype? What will likely be my genotype is I hardly fall sick? Hello. Our recommendation is for you to do a sickle cell test (hb electrophoresis) because the expression of the disease (phenotype) varies for people with the same genotype. We cannot therefore predict your genotype based on the information provided. Kindly visit the nearest lab for testing. Thank you. From your comment we can infere that you did Sickling tests on both occasions. We recommend you do an HB electrophoresis test to know your exact genotype to clear any doubts. This tests will let you know if you are AS, AS, AC, SS, SC, etc. rather than negative or positive which is inadequate information. Hb electrophoresis costs 30 cedis averagely.